What better way to celebrate Halloween than with a Monster Pack Giveaway? Enter below for a chance to add more monster-filled fun to your game night! 1. Promotion Description: Times and dates are subject to change at IELLO’s sole discretion. 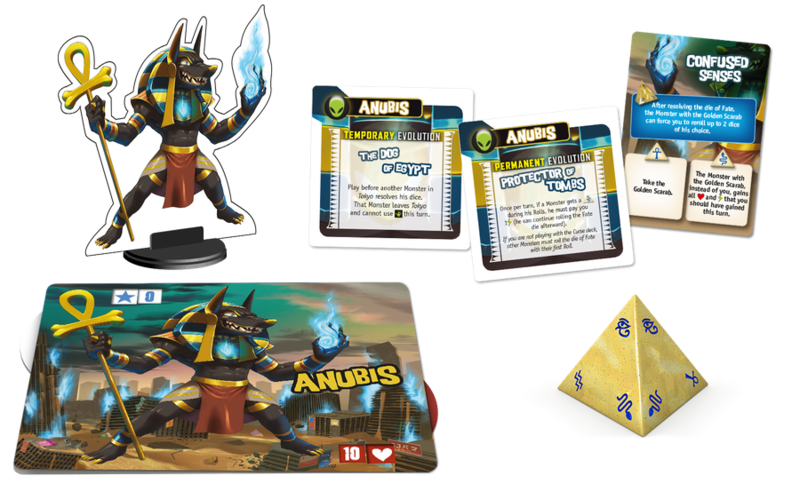 The ‘Anubis Monster Pack’ (“Sweepstakes”) begins on 10/31/2018 at 9:00 PM (Eastern Time (US & Canada)) and ends on 11/07/2018 at 11:59 PM (Eastern Time (US & Canada)) (the “Promotion Period”). By participating in the Sweepstakes, each entrant unconditionally accepts and agrees to comply with and abide by these Official Rules and the decisions of IELLO (“Sponsor”), which shall be final and binding in all respects. Sponsor is responsible for the collection, submission or processing of Entries and the overall administration of the giveaway. Entrants should look solely to Sponsor with any questions, comments or problems related to the Sweepstakes. 2. Eligibility: Open to legal residents of USA, Canada, Mexico, France, who are 18+ or older. Void where prohibited or restricted by law. Sponsor and their respective parents, subsidiaries, affiliates, distributors, retailers, sales representatives, advertising and promotion agencies and each of their respective officers, directors and employees (collectively, the “Promotion Entities”), and members of their immediate families and/or persons living in the same household as such persons, are ineligible to enter the Sweepstakes or win a prize. Canadian residents will be responsible for any customs fees incured in order to receive the prizes. Prize will only be awarded and/or delivered to addresses within USA, Canada, Mexico, France. All federal, state and/or local taxes, fees, and surcharges are the sole responsibility of the prize winner. Failure to comply with the Official Rules will result in forfeiture of the prize. 5. Online Entry: Enter the Sweepstakes during the Promotion Period online by signing into the entry form and perform the tasks provided. The entry form can be found on the following website at . Automated or robotic Entries submitted by individuals or organizations will be disqualified. Internet entry must be made by the entrant. Any attempt by an entrant to obtain more than the stated number of Entries by using multiple/different email addresses, identities, registrations, logins or any other methods, including, but not limited to, commercial contest/sweepstakes subscription notification and/or entering services, will void that entrant’s Entries and that entrant may be disqualified. Final eligibility for the award of any prize is subject to eligibility verification as set forth below. All Entries must be posted by the end of the Promotion Period in order to participate. Sponsor’s database clock will be the official timekeeper for this Sweepstakes. 8. Winner’s List: To obtain a copy of any legally required winners list or a copy of the Official Rules, send the applicable request and a self-addressed, stamped, #10 envelope to IELLO cc: Fairy Tile at 5550 Painted Mirage Rd Suite #320 Las Vegas, NV 89149. Request must be received no later than 48 hours + 6 MONTHS for the name of the winner and, by the end of the promotion, for a copy of the rules. Remaining Draccus characters for purchase! The lovely people at Worldbuilders just checked in with us to let us know that there are approximately 3,000 Draccus promo characters available for purchase at their site. They have already sold 1,000, which means they’ve raised $20,000 for the Heifer International charity! This is already a lot of money but they could raise even more with help from you! For information on Pat’s charity Worldbuilders, visit www.worldbuilders.org. To see what sort of geeky goodness The Tinker’s Packs carries, head over to www.thetinkerspacks.com. And finally, if you’d like to see how Heifer International helps impoverished families and communities, visit www.heifer.org. Draccus promo available for purchase! If you weren’t able to snag a Draccus at Gen Con 2015, you are now able to make an online donation to the Worldbuilders charity to claim one as your own! 100% of the sales of the new Draccus card will go to support Rothfuss’s charity Worldbuilders, which has to date raised over $3.5 million for Heifer International to help end hunger and bring families and communities out of poverty. So you’ll be able to destroy Tokyo with a clear conscience! The Worldbuilders staff are also a bit crazy for tabletop and role-playing games, and one of their favorites is King of Tokyo (not even kidding: visit www.worldbuilders.org/news/jeff-is-king-of-tokyo for the latest saga). There may be fights over who gets to be the Draccus. 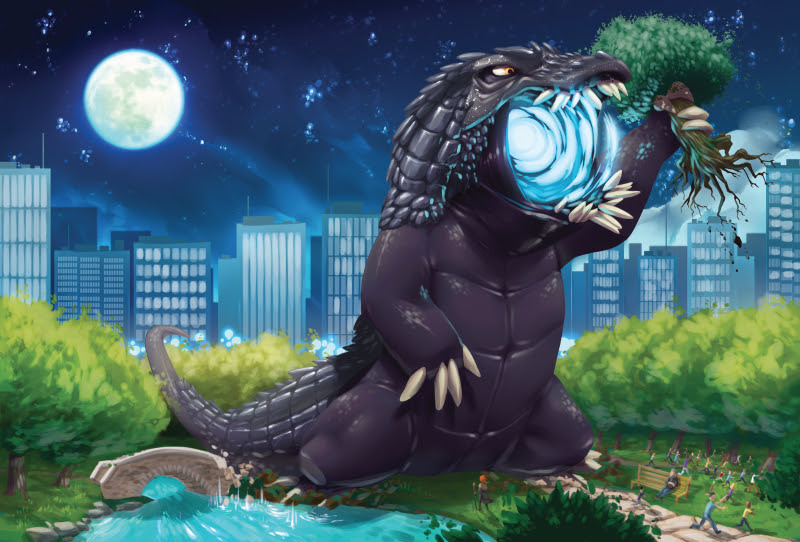 For information on King of Tokyo and the other awesome games IELLO makes, visit www.iellogames.com. For information on Pat’s charity Worldbuilders, visit www.worldbuilders.org. To see what sort of geeky goodness The Tinker’s Packs carries, head over to www.thetinkerspacks.com. And finally, if you’d like to see how Heifer International helps impoverished families and communities, visit www.heifer.org. For more info on the Draccus and its inspiration, check out the previous blog post we wrote about it. 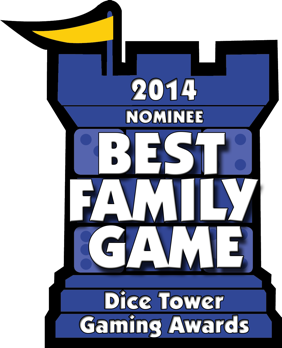 IELLO nominated for The Dice Tower awards! The nominations just keep coming! 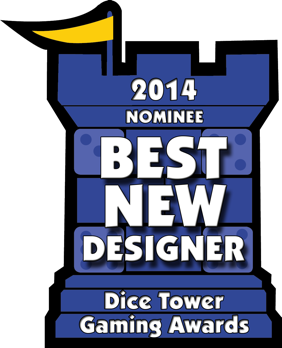 The Dice Tower has just released their nominations for games released in English in 2014. A jury of more than fifty of their staff, prominent bloggers and reviewers chose the best five games in each category and IELLO is included in three of those categories! There may be some of you wondering what the heck’s up with Medieval Academy. This game was first published through Blue Cocker Games, but we are currently in the process of reprinting it for our US supporters. Keep your eyes peeled for its release in early summer! See the complete list of nominations with pictures here! As always, thank you to the team at The Dice Tower and to you all for enjoying our games and supporting what we do! Time is going by fast, and we’re getting closer and closer to GenCon 2015! Just like last year, we will be hosting a King of Tokyo/King of New York National Qualifier Tournament during the convention. Since we now have King of New York in the mix, the tournament structure will be different from last year’s. The first few qualifying rounds will be played with King of Tokyo and then we will move on to King of New York for the final round before crowning an ultimate winner. Everyone who won a KoT/KoNY tournament at their local store or convention will be invited to participate and will have the chance to be named the 2015 National King of the Universe Champion. If you have already won a tournament, CHECK HERE to make sure your name is on our list. If it’s not – contact your local game store and make sure they fill out their After Action Report! It’s how we keep track of our winners and their contact info. If you haven’t won a tournament, but are excited about the chance to be invited, show your local game store this link and ask them to host a tournament! There’s still time! Otherwise, we will contact all the winners a month before the event with additional, more precise information. Of course, if you have any questions in the meantime, feel free to contact us at sara@iellogames.com or danni@iellogames.com for clarification and help!